A new study has found that when you get zebra finches totally wasted, they become noticeably worse at singing. They probably think they sound awesome, though. Then they probably want to fly somewhere to get little bird-sized burritos before crying into a bird-sized phone to some ex-birdfriend, before spending the rest of the night with their heads in a bird-sized toilet. 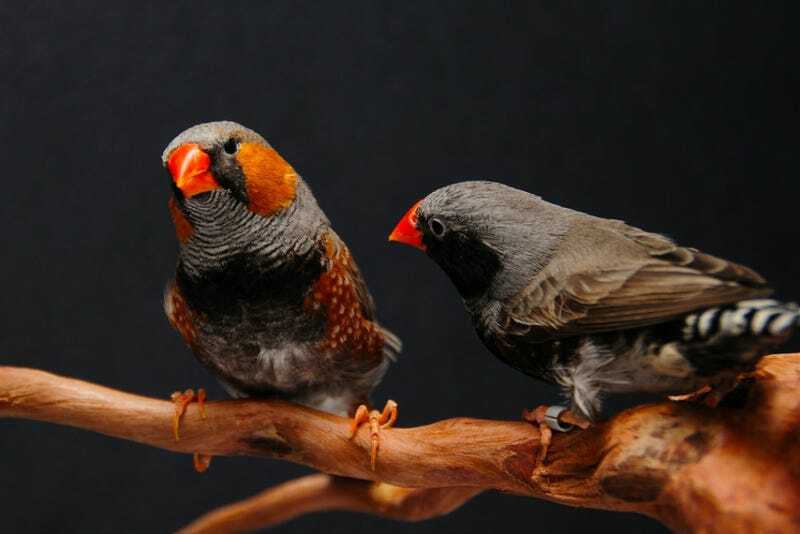 This foray into Important Science Breakthroughs comes to us from the Oregon Health and Science University, where researchers put some alcohol-laden juice into the water tanks of their zebra finch subjects as part of a study on how alcohol affects speech. "At first we were thinking that they wouldn't drink on their own because, you know, a lot of animals just won't touch the stuff," lead researcher Christopher Olson told NPR. "But they seem to tolerate it pretty well and be somewhat willing to consume it." Olson and his co-bird inebriators found, though, that the changes in singing occurred without significant changes in other aspects of the finches' behavior. "Remarkably, these effects on vocalizations occurred without overt effects on general behavioral measures, and importantly, they occurred within a range of BEC that can be considered risky for humans," they write. "Our results suggest that the variable effects of alcohol on finch song reflect differential alcohol sensitivity of the brain circuitry elements that control different aspects of song production." More importantly, it teaches us that finches, with a little prompting, will totally get schwasted. If you're feeling concerned about the birds' conditions, rest assured that according to these care guidelines from OHSU, the finches usually don't spend their days getting forcibly drunk, instead existing on a diet of scrambled eggs, formula, vegetables and seeds, plus lots of yarn and bark for "environment enrichment."